Benjamin Law is among a growing number of artists who are getting behind and supporting fellow artists and donating to some great ACF campaigns. Benjamin recently supported Pencilled In’s crowdfunding campaign to fund their first issue. An accomplished and prolific writer himself we asked Benjamin why it’s so important for artists to back other artists and what he thinks of the ACF. ACF: Hi Benjamin! Thanks for talking with us. Benjamin Law: My boyfriend and I just finished Legion (FX/Foxtel), which is ostensibly an X-Men spin-off, but much more cerebral – imagine if Michel Gondry directed a TV show about superheroes and mental illness. I’m dipping into Big Little Lies and watching the back catalogue of Armando Iannucci who created Veep (one of the best comedies of all time), since I’m interviewing him for the Sydney Writers’ Festival. Also: Fleabag and the latest series of Catastrophe – two brilliant British comedies. And to my great shame, The Real Housewives of Sydney. It’s an absolute garbage fire of a show, but it’s very funny and has great harbour views. Just finished David Marr’s brilliant Quarterly Essay on Pauline Hanson, and looking forward to Anna Krien’s forthcoming QE on the Great Barrier Reef, coal mining and climate change. I’m also reading Peter Polites’ debut novel Down the Hume, which is damn fine Australian queer writing, and Guilia Enders’ Gut – a book about the human digestive system – for my book club. Everything in sight. But at home, I’m mainly making sourdough bread, Stephanie Alexander’s chicken and leek pie and this great smash recipe of Ottolenghi’s that involves polenta and mushrooms. I’m kind of time-poor at the moment, so I’m looking for piss-easy recipes with maximum results. Tell us how you learnt about Pencilled In’s campaign and what motivated you to get behind it? Yen-Rong Wong is a really interesting and talented young Asian-Australian writer, and when I heard she was putting together a new magazine of Asian-Australian writing, I wanted to support it immediately. What makes Pencilled In so unique and what about this particular project makes you want to shout about it from the rooftops? Roughly 1 in 10 Australians have significant Asian heritage nowadays – roughly the same proportion of black Americans in the US – and our stories still don’t get much traction. And as someone who got a big break through an anthology of Asian-Australian writing (Growing Up Asian in Australia, edited by Alice Pung), I recognise these opportunities and platforms are important. How do you see the Australian Cultural Fund and crowdfunding more generally fitting into this equation and what advice would you give to writers who are just starting out? It’s kind of mindblowing to think that crowdfunding is, relatively, a pretty new phenomenon, but I like how it makes art projects viable, democratises access and creates a sense of community and shared ownership in the process. It’s important that it isn’t seen as a replacement for robust government funding of the arts, but I think it can be really helpful ancillary and complementary strategy. Did you know about the ACF before you supported this project? Nope! But I’m glad I do now. I’m working on a couple of major projects: another series of a TV show I helped make, as well as a piece of longform journalism. I’m idiotically lucky they got the support of production companies, broadcasters and publishers, but if they were projects in their infancy, who knows – maybe ACF could totally help. What would you say to encourage others to support local artists and why is it so important? Sometimes I think we discuss arts as a luxury outside of every day life. But the arts are central to who we are – the stories we watch on telly, the clothes we wear, how our kids are educated, how we spend our evenings and weekends. Our most famous built structure houses the arts and more people go to Australian art galleries in a single year than attend AFL matches. Like sport, the arts are a nation-building exercise. We should all support that. Give us three reasons why Australia needs more publications like Pencilled In and why we should all get behind them. 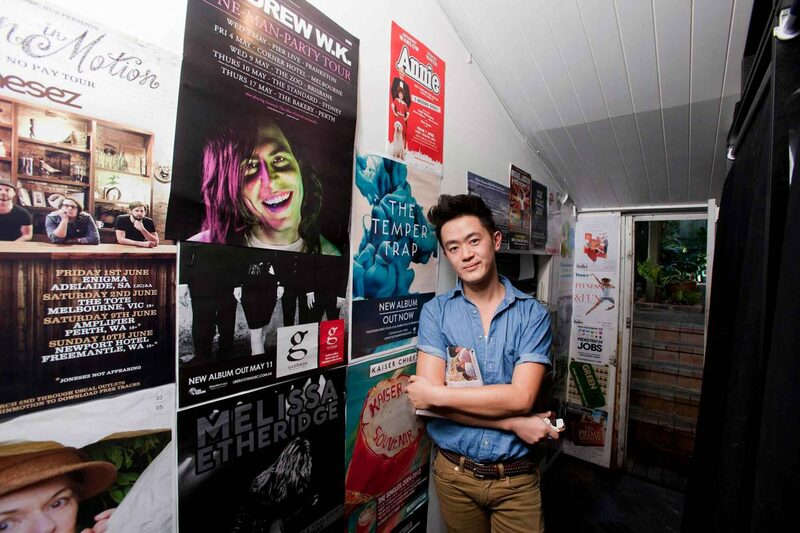 Benjamin Law is a freelance writer and a senior contributor to a tonne of great publications including Good Weekend, Frankie, The Monthly, The Lifted Brow to name just a few. Among his many achievements Benjamin has published two books, including The Family Law which is now in its fourth reprint, has been translated into French and is now a major SBS TV series. Follow, read and find out more about Benjamin here. Thanks to 32 generous supporters Pencilled In raised 78% of their target which was enough to greenlight production of Issue one. Order your copy here.